Daniel Negreanu delivers a quick, important lesson following a hand from the 2015 WSOP Main Event shown on ESPN. The next time you're in a hand and are about to bet or raise, consider this one important factor before you do. Following a hand between Daniel Negreanu and Neil Blumenfield from Day 5 of the 2015 WSOP Main Event, Negreanu delivers a quick, memorable poker lesson. During one of the ESPN broadcasts of the 2015 World Series of Poker Main Event, Daniel Negreanu tossed off a useful poker lesson to attentive viewers, though I don’t think he necessarily intended to do so. Let me set up how it happened. It came during Episode 8 of this year’s shows, starting at about the 6:30 mark in case you still have it on your DVR. There were 87 players left in the event and they were at Level 25, with blinds of 20,000/40,000 and a 5,000 ante. Neil Blumenfield — who would eventually go on to finish in third place — was on the button in Seat 7 with a stack of about 2.7 million. 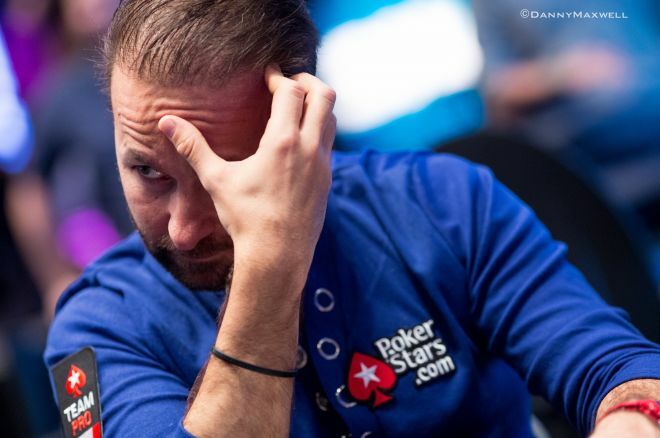 Negreanu — who would end up making it to 11th — was in Seat 2, with a stack of about 2.3 million. Negreanu opened for a raise to 95,000 with . Blumenfield reraised to 210,000 with . Negreanu then four-bet to 510,000. Blumenfield called, making the pot 1,125,000. The flop was . Negreanu bet 400,000. Blumenfield called, making a pot of 1,925,000. The river completed the board. Both players checked again. The cards were revealed, and Negreanu won. So there’s the lesson: Before you bet (or raise), know what you’ll do if your opponent raises you back. If you don’t know, it’s usually better to check than to bet, or to call rather than to raise. If you fail to heed this principle, you’re suddenly stuck with both (1) a difficult decision and (2) a bloated pot — a toxic combination. A difficult decision is always bad because your probability of making a misstep is higher than it is for easy decisions. And with a bigger pot, any mistake will be more expensive. I remember where I was the first time I encountered this piece of advice. I was eating at a Subway sandwich shop on my way to one of my first live poker tournaments at an Indian casino in Wisconsin in about 2004. I was reading one of my first poker strategy books. Unfortunately, I now can’t remember which book it was, though I’m guessing it was by either David Sklansky or T.J. Cloutier, since I read a couple from each of them before moving on to other authors. The admonition has stuck with me ever since. That is not to say that I remember it every time I should while I’m playing. I don’t, and I when I don’t I often regret it immediately. An unexpected raise from an opponent, putting me into a treacherous spot, always brings it back to mind: “Oh yeah, I should have thought about this possibility before I made that bet.” As I’ve been making the same mistake at least occasionally for over a decade now, you can safely conclude that, at least on some points, I’m a slow learner. Note that the advice doesn’t mean that a bet or raise is considered to be precluded by whatever you decide your reaction to a raise will be. You might be on a total bluff, with a fold the only sensible response to a raise, and yet still decide to go through with it. Or maybe you have the nuts, and would love to see your opponent raise, so that you can pop him right back. Your bet is a complete bluff, but your opponent is capable of bluff-raising. You will need to evaluate the size of his raise in comparison to previous betting patterns, and consider any tells he gives off, before deciding whether to fold or re-bluff. Your bet is a probe, trying to provoke a response because you’re not sure whether your hand is best. All three possible responses to an opponent’s raise — reraise, call, or fold — can still be open to you at the time you make such a bet, with your decision depending on his bet-sizing, body language, and whether any players in between you call or raise before you have to act again. Still, it’s generally good advice to have at least a tentative plan for what you’ll do if your bet is met with a raise, and, if the answer isn’t clear, consider checking instead. Taking Negreanu at his word, it appears that was the factor that led him to choose a passive line. Looking back at the hand, it wouldn’t be hard to guess what worried him, even if he hadn't made it explicit for us. At that table Blumenfield had mostly been a straightforward player, not given to crazy or highly creative plays. Therefore, Blumenfield reraising Negreanu’s early-position raise immediately narrowed his hand range sharply. and were squarely in the remaining range, reasonably causing Negreanu to fear that Blumenfield had sucked out with a postflop set. Consider the fix Negreanu would have been in had he bet on fifth street without first pausing to consider how he would react to a Blumenfield raise. The pot was about 1.1 million, and he had about 1.8 million left in his stack. Blumenfield had about 2.2 million left. Suppose Negreanu bet 600,000 — about half the pot. Any raise from Blumenfield would be all in, and Negreanu would have to decide whether to call off all of his chips, an unenviably difficult spot. If he calls and is wrong, he’s out of the tournament. If he folds at that point, he’s down to about 1.2 million chips, just 30 big blinds. One of the ways I evaluate how a poker session went is to count the number of times I put my opponents to difficult decisions versus the number of times they forced one on me. I want to have to make as few difficult decisions as possible, while compelling everybody else to make as many as possible. A basic, reliable tool for reducing the number of difficult decisions you have to make is to figure out in advance how you’ll respond to an opponent’s raise of your bet. Train yourself to think this through before pushing chips forward, and you’ll be that much closer to Negreanu’s level of poker.